A man in a rural region near Kingaroy, Queensland, Australia has made an extreme claim. He says he is Jesus, yes, the Christ, and that his partner is Mary Magdalene. He claims to remember the crucifixion and the emotions of Mary as she watched. He remembers resurrecting several people including Lazarus. AJ Miller now runs a religious movement called "Divine Truth" and teaches seminars, sells DVDs, and takes donations. Someone I know was pulled into a discussion of how one would go about proving this guy to be wrong. His friend on FaceBook, once a Christian, but now an atheistic humanist asked how we Christians could discern whether or not such a person's claims were true. The humanist friend was perhaps suggesting that Christians are a little too willing to accept truth claims without sufficient proof. I think we can tackle such a problem with logic and faith. While seeking to be charitable to all involved in this discussion I would suggest that there are multiple ways to weigh the evidence and find it wanting in a case such as this. Some would simply argue from biblical texts and show that this man's life, and the circumstances of his birth and life do not fit with what the Bible has to say about the return of Jesus Christ. I believe several others have already waded into this discussion with quotes from the Bible. If one is willing to accept the Bible as the words of God (indeed, the Word of God, and Jesus as the incarnation of that Word) then it is quite simple to show that this person did not show up the way the Bible says Jesus will return. However, let us consider the community in which these questions are being debated. Most of the FaceBook audience will not want you to start from the Bible. If someone does not want a Biblical argument we might start at a different place. We could ask the other person, "Who do you think Jesus was?" "Who do you think he is now?" "Why do you think he might come back to the earth?" Then, based on what they think of Jesus we might say, "Does this guy fit your expectation of the "return" of Jesus?" If he does fit what they expect we might warn them to be cautious about turning over their life-savings to the guy and wish them luck. We might say that we think this guy does not fit our understanding of the Messiah and that he has not returned in the way the Bible has said he would; but, in God's economy he does allow people to do things that are spiritually dangerous and allows them to walk away from him. We do need to recognize that we live in a world without absolute proofs. We have axioms, theories, and evidence which support a theory to the point where the theory becomes a statistical proof. At some point we start to believe the statistical proof is close enough to proof to say "I believe in that theory." Those of us with a faith background still use some form of theory, evidence, statistical proof, and belief. I cannot prove God exists. I have pretty good evidence that someone named Jesus existed. I have plenty of literary evidence to substantiate some of what he said. At some point I begin to believe in God and in the deity of Jesus. In further conversations with those who believe that AJ Miller is Jesus, we might have to resort to further logic. If I were to make the claim that I am a poached egg (to follow a line of reasoning presented by C.S. Lewis), then you would have to determine, "What is a poached egg?" "Does Keith fit with my expectations of what a poached egg should look like or act like?" If Keith does not fit this then one of our definitions of a poached egg is wrong. If I am not a poached egg, then I am either a liar or mentally unstable in suggesting that I am a poached egg. AJ Miller is not the first person to claim to be the returning Messiah. His claims may simply be more direct than some others before. It will be interesting to watch his religious movement and see what becomes of him and his followers. 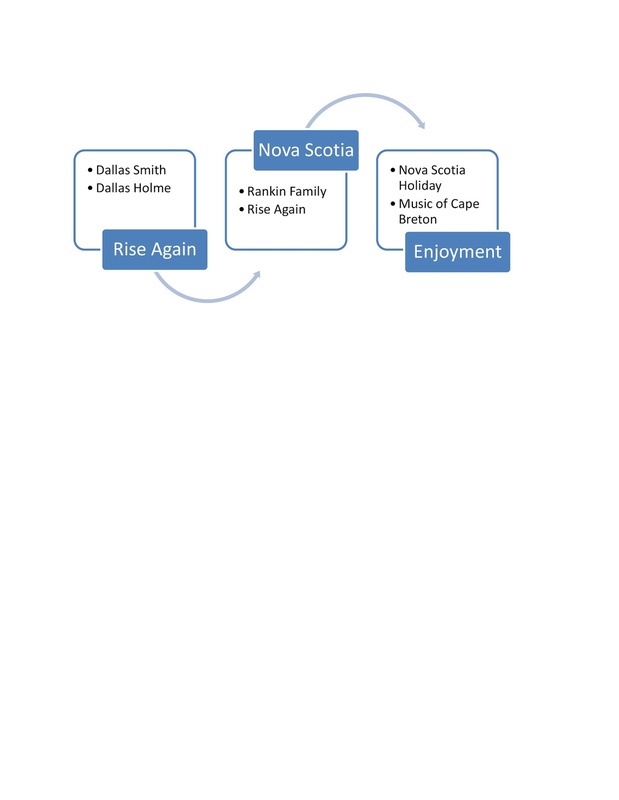 If it follows previous patterns, we can expect that the movement will end in disunity or disaster. Perhaps the words of Gamaliel are in order here: "Leave these men alone! Let them go! For if their purpose or activity is of human origin, it will fail. But if it is from God, you will not be able to stop these men; you will only find yourselves fighting against God." Acts 5:38, 39. At this point, there is no evidence to suggest that AJ Miller is from God. Some people have the ability to think beyond their own time and consider what the world might look like in generations to come. One such person that has recently caught my attention is Colonel Edwin "Buzz" Aldrin.1 Aldrin was the second person to set foot on the moon and has led a life of celebrity since that epic 1969 mission. He is a fascinating person and, in his 2009 biography, Magnificent Desolation, he is open about his personal struggle with depression and alcoholism following his NASA career. He is also outspoken about his Presbyterian faith and is known for having celebrated communion on the moon. Aldrin has continued to invent and discover new concepts. In 1985, at the age of 55, he discovered an orbit which would allow an object such as a comet or spacecraft to cycle between the earth and Mars. Aldrin proposed that humans could take advantage of this orbit and insert a spacecraft (sometimes called the Aldrin Cycler) into this orbit that could carry men and women to Mars. 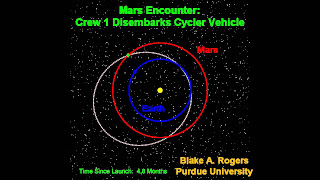 The cycler would continually orbit between Earth and Mars with periodic close flybys of each planet. One complete orbit would take two and one seventh years, while the trip from earth to Mars would take around five months. 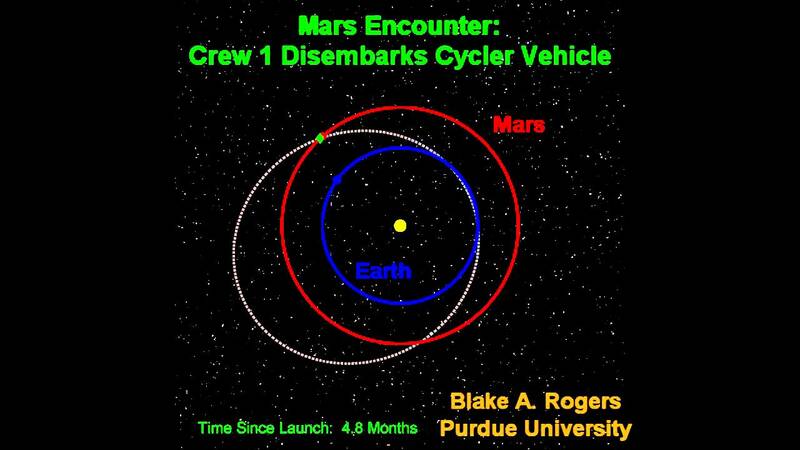 Mars missions could rendezvous with the cycler at these strategic flyby points and personnel could ride the cycler between the planets. They would exit at the next close encounter. This would reduce the amount of rocket fuel needed to travel between the two planets as it uses the gravitational tugs of each planet in a gravity assist flyby. Take a look at this video that describes how the concept works. From a science and technology perspective, it is a fascinating concept. Once the cycler was inserted into its orbit, the initial trips could be devoted to delivering materials to this neighbouring planet. Robotic missions could place living quarters, food supplies, and other things needed for the first missions with humans on-board. Imagine hitching a ride on an artificial comet safely protected from the cosmic rays of space. A rotating living space inside the cycler could generate an artificial, centripetal gravity where travelers could carry out experiments on scientific questions related to space travel as they spent five months on the journey to the planet. Then, when the travelers arrived they could explore the surface of Mars, set up a scientific station on the planet, and perhaps eventually colonize the planet. The other aspect of this story that is also of interest to me is the mindset of "Buzz" Aldrin. He is definitely looking toward the future with this proposal. He is now 83 years old and the project would not possibly get started before 2020. He is pioneering and seeking to contribute to something that will benefit future generations. Many times in business, science, and even the church, our vision is very short-sighted. If there is no benefit for our present or for our immediate future, we tend not to think about such things. I like reading about those who are dreaming and creating a vision for the future. We need more of these dreamers. Perhaps I can integrate some of Aldrin's spirit into the work I do. I will give some thought to how I can help build a better future for those who will come after me. Let us pray for others that, "the Lord might be with them as they grow up." May we all be filled with the words of the Lord and may he continue to reveal himself to us. I pray that we might not live in a time in which the word of the Lord is rare; a time when there are not many visions. May we hear from and see the activity of God in our time and place. My conscience is broken. But then, so is yours. They are broken because our world is broken. When you grow up in a chicken coop you believe that a pecking order is natural. When you grow up in a world where Canadians are wealthy and Haitians are poor you believe that such a distribution of wealth is natural. Certainly, these situations are "natural" and a "natural" conscience sees them as normal and functions accordingly. We cannot trust our natural conscience, it has been influenced by our selfish desires. Paul, the Apostle, said, "My conscience is clear, but that does not make me innocent. It is the Lord who judges me. "1 Even his conscience was untrustworthy. Our consciences must be supernaturalized. If we listen to the Spirit of God rather than our own selfish desire, a revolution occurs. The distribution of wealth that seemed so natural before now becomes a situation that grieves us and one which we desire to change. If indeed the Spirit of God lives in us, we must learn to listen to the Spirit and let it govern our lives. We must let the Spirit revolutionize our conscience. This is the way to life and peace. In the song, "It's Me Again," I have never been quite sure whether Wayne Kirkpatrick is addressing the lyrics to a friend or to God. I suspect that it may be both. Kirkpatrick tends to do this with his songs. Regardless, from my time spent coaching others, and from my own life, I am convinced that many of us will be able to relate to these words of weakness and trust. In the liner notes, he says this about the song. There is a great line in the movie Broadcast News where Albert Brooks says, "Wouldn't this be a great world if insecurity and depression made us more attractive?" If that were so, we would have a world of incredibly beautiful and appealing people. I should be so lucky. The song is an insight into a mind that is being honest with God and admitting that he is not as strong as people believe he is, or even as strong as he believes he is. Yet, the songwriter knows where to turn. He is well aware that he has been here before. He keeps on turning to the same person who will save him from the poets and the poltergeists. He keeps on turning and returning, yeah, yeah, yeah, yeah, yeah, yeah, yeah, yeah . . . . me again. From the Album, The Maple Room. A friend recently introduced me to the spiritual discipline of praying through Psalm 3. It is particularly helpful when we are at a place in life in which we feel that there are many difficulties mounting against us or when the complexities of life seem overwhelming. The word "selah" appears three times in Psalm 3. Selah is a word which has no good English translation but indicates a pause in the Psalm. It may represent a musical interlude (the equivalent of a guitar solo in the middle of a song). Its main purpose is to cause the listener (or reader) to take a few moments to think about what has been said; to stop and listen. Take a moment to list some of the "foes" you are facing in life, whatever genuine or imagined fears and difficulties you sense in your life. Pay attention to what is going on inside of you. Don't be afraid to speak these fears no matter how real or ridiculous they may be. Lay them out on the table and have a good look at them. Examples might be concerns about the possibility of losing a job; relationship problems; money issues; health problems. Speak them out loud and say to God, "These feel like the foes that are against me." Psalm 3:3, 4 goes on to say, "But you are a shield around me, O Lord, my Glorious One, who lifts up my head. To the Lord I cry aloud, and he answers me from his holy hill. Selah." Make the words of verses three and four your own. Speak these words of affirmation, "God, you are indeed the one who lifts my head. You are a shield that protects me. I cry out and you answer me. You will hear me when I pray." Pray this and allow it to soak into your soul. Psalm 3:5, 6 says, "I lie down and sleep; I awake again because the Lord sustains me. I will not fear the tens of thousands drawn up against me on every side." Recognize that we need not fear our enemies. The foes listed are known to God. We do not need to fear them for he is ultimately in control. Psalm 3:7, 8 says, "Arise, O Lord! Deliver me, O my God! For you have struck all my enemies on the jaw; you have broken the teeth of the wicked. From the Lord comes deliverance. May your blessing be upon your people. Selah"
Cry out like this to God. Ask him to deliver you and to save you from your enemies. The fears, worries, difficulties, foes of this life can seem to have teeth that bite into our lives and limit our effectiveness. God can destroy the bite of these things. He can break the teeth that have their grip upon us. Recommit yourself to serving God and trust him to rescue you. Selah. When I was a kid, I used to look at my compass and imagine why one end of the needle pointed 17 degrees east of north. I imagined that there was a large chunk of negatively magnetized metal sitting just a little to the right of the north pole and another positively magnetized chunk of metal somewhere near the south pole of the earth. This naive way of thinking about the earth's magnetic field was obviously wrong but it is amazing to note that scientists are still trying to work out how this important phenomenon actually functions. We (and the animals of this planet) have used this feature for navigation for centuries; yet, we still know surprisingly little about it. The best theories of how the magnetic field functions were worked out in the 1830s. "Science News" recently had a short article on some experiments presently being performed that may shed more light on how the magnetosphere1 functions. The following quote from the article contains a simplified explanation of our present understanding of how such a field has come to exist on our planet. Daniel Lathrop, whom I have nicknamed, the "Magneto and Sodium Man,"3 is a physicist at the University of Maryland, who has built a spherical model in his laboratory. It is made up of two spheres nested one inside of the other and contains twelve tons of molten metal. The two spheres spin independently at high speeds in a manner that mimics the rotation of the earth's outer crust and inner solid core with liquid metal in between. Compare the two images below. Lathrop thinks his "machine will have no problem generating a dynamo once it powers up to full speed, probably later this year. "4 The mechanism may also offer insights into magnetic field reversals like those seen on Earth. I am always fascinated by grand experiments and people who take on the challenge of discovering what makes something work. Our planet still has many mysteries. I look forward to the results of these experiments in the near future. 1 Wikipedia has an animation of the far reaching effects of the earth's magnetic field: http://en.wikipedia.org/wiki/Magnetosphere. Wikipedia. Magnetosphere. April 23, 2013. http://en.wikipedia.org/wiki/Magnetosphere (accessed May 13, 2013). Witze, Alexander. "Spinning the Core." Science News 183, no. 10 (May 2013). A recent conference in Calgary has me dreaming of the kind of church that will thrive in the next generation. James Penner was the guest speaker at the Western Canada Leadership Summit and he challenged us to think about the characteristics of the Millennial Generation (variously defined, but for the purposes of these talks, defined as "young people born in the 80s and 90s and coming into their adult years now, in this new millennium."1). The talks were based on his own research published in a report entitled "Hemorrhaging Faith". 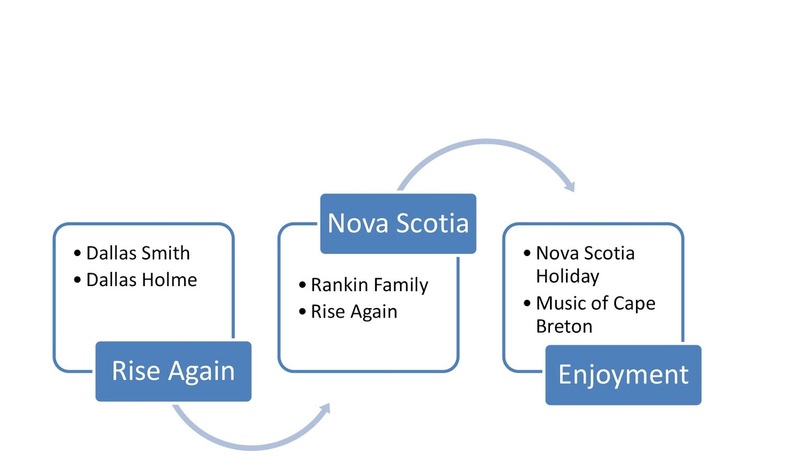 The research consisted of 250 hours of literature review, 72 coast to coast interviews, and 2,049 Angus Reid survey responses. * whether or not their parents attended religious services. This is not to say that Boomers or Gen Xers like these toxins; but, rather that Millennials have a lower tolerance of them and greater detectors for them. "If these exist in the church, they are not just a little dust in a corner, they are a hairball in the soup!" The most often quoted statement of the seminar was that of Peter Berger and Thomas Luckmann who said, "Worldview hangs on the thin thread of conversation. "3 That is, we don't change worldviews through argument but through listening to others and sharing our own perspective. This statement is even more true now than when it was first stated in 1966. James Penner further suggested that young people have seen the pursuit of perfect bodies but they seldom see anyone pursuing a perfect soul. He believes that they are looking for a church that empties itself in the same way that Christ emptied himself (Philippians 2:5-8): "A self-emptying Christ requires a self-emptying church. "4 I think I am beginning to see what this future church might look like. 4 Adapted from various authors and the concept of kenosis. Berger, Peter, and Thomas Luckmann. The Social Construction of Reality. New York: Open Road Integrated Media, 1966. Surrounding all of this process is the consciousness which allowed me to see this as it happened and now analyze it again two days later. It is a consciousness that allows me to analyze not only the logical steps but the emotions of the process as well. At a further level, I find myself thinking about the neurons which must connect to make this whole progression work. What would that look like in my brain? Where are the various bits of information stored? How are they retrieved? At certain points I used conversation with my wife and the internet as external inputs to speed along the process. How does the brain assimilate all of this material and pull it together in a logical package? These and others are the questions being asked in contemporary brain science investigations. Consciousness, and why it exists, is still a great unexplored territory. This kind of consciousness appears to be unique to humans. We seem to be the only species on the planet capable of thinking about thinking and being aware of our understanding and our limitations. At some point we may have a more complete answer to some of the questions posed; yet, we can expect that there will always be a degree of mystery. This mystery rightly points to the Creator who has made humans a project unique among all created things. 1. The mind map also illustrates the limitations of the brain. In my mind, the last name was spelled "Holme" but my brain had stored it with an incorrect spelling. It is really spelled "Holm." In a time when many would say they are Christians without attending any expression of the Body of Christ, these words of Henri Nouwen are very appropriate. When we have been wounded by the Church, our temptation is to reject it. But when we reject the Church it becomes very hard for us to keep in touch with the living Christ. When we say, ‘I love Jesus, but I hate the Church,’ we end up losing not only the Church but Jesus too. The challenge is to forgive the Church. This challenge is especially great because the Church seldom asks us for forgiveness, at least not officially. But the Church as an often fallible human organization needs our forgiveness, while the Church as the living Christ among us continues to offer us forgiveness. It is important to think about the Church not as ‘over there’ but as a community of struggling, weak people of whom we are part and in whom we meet our Lord and Redeemer.